It all started about 18 months ago. H2 was recruited to play on a Kickball team by a friend and they finished up their first season (Summer) with a championship. H4 and I expressed curiosity and were invited to join them for the Fall season. The rest of the story now lives on in Kickball lore: 4 more titles in 6 seasons, capped by this years Winter season title and completion of the career Grand Slam. The triumphant return of our star player “Hot Puma” and the vanquishing of one of our nemesis’s “The Chukars” (We had not beaten them in 3 previous attempts), made the day even sweeter. 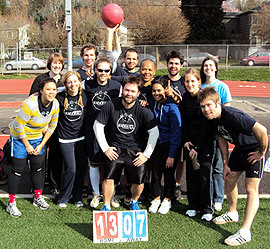 Picture Below: a collection of some of the greatest Kickball athletes ever to lace ’em up. A nice start to my favorite month of the year. Known mainly for the college basketball madness that occurs during the final 2 weeks, March also brings many family birthdays. Other months in the running: May (Mt. Hood hikes and golf scrambles) and June (More golf scrambles and warmer weather). Which brings me to this years tournament. 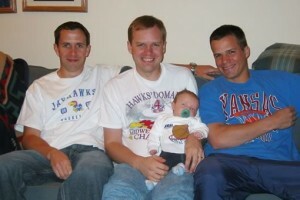 My Kansas Jayhawks are the favorite to win it all, which has normally led to disappointment. For the past couple years, I have tried to to be less emotionally impacted by the ebbs and flows in sports. Losses by the Jayhawks in the NCAA tournament have made me more depressed than even my own personal failures. I am not ashamed to admit that after we lost to Syracuse in ’03, I nearly cried. I have hated Carmelo Anthony ever since and if I ever see him in person, I will probably pretend to punch him in the face after he is out of sight. In the NCAAs, one loss and you are done, 4 months of basketball finished in 40 minutes, 8 months until the next season starts. But now, I say that things like the Trailblazers blowing a 25 point lead to the Jazz and losing in overtime, don’t effect me. Even their 4th quarter blowup in LA back in 2000 that led to a 3-peat for Shaq and Kobe, … well that was actually really bad and could be the worst defeat for any team I have ever cheered. But stuff happens in sports, especially college where most athletes aren’t old enough to have fun in Vegas. The Beavers losing to the Ducks two years in a row with the Rose Bowl on the line, is tragic but understandable. Have you seen the shape of a football, how can you predict anything in that sport? I think the teams we rooted for in our youth, especially those that attained success, tend to get more of our emotional investment. KU basketball will always be the one for me, with OSU football a distant 2nd, and Blazers 3rd. Sports are fun, almost more so to root for than play. I will continue to over celebrate the highs and pretend like the lows don’t mean anything. Rock Chalk!